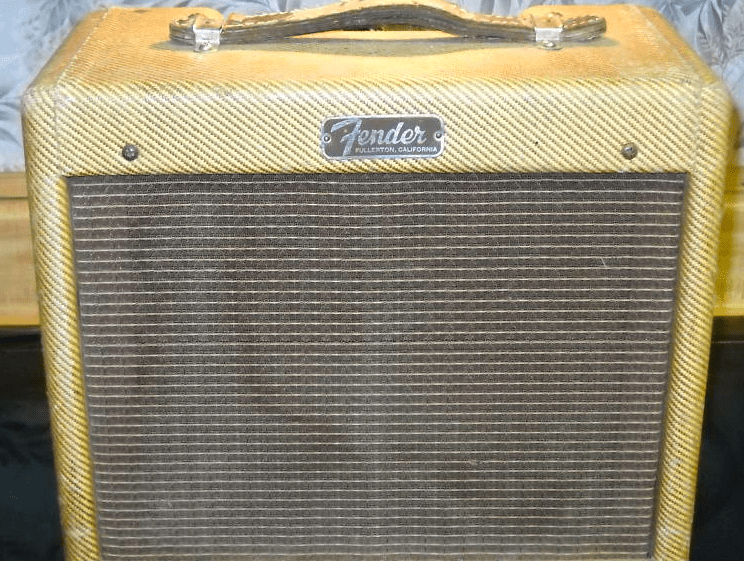 Another vintage tweed Fender Champ today. This one is serial number C 03323. This serial number tells us this is a very early 1957 amp. The tube chart is stamped FL which tells us this was made in December of 1956. We are lucky enough to have a picture of the speaker code 465-639 which tells us this in an Oxford speaker made in the 39th week of 1956 (early September). This makes sense if you figure that a speaker would have to be made prior to the amp being assembled and could often wind up sitting around for a while. The power cord is not original and it looks like some wires going in to the rectifier tube are plastic instead of cloth. So, we have a pretty good idea of how old this amp is. Even with a variety of dating methods, it can be difficult to nail down a precise age. Sometimes close enough will have to do!